POSTCARD#94: Chiang Mai: I’ve been without my computer for about two weeks now. When I tell people this they’re shocked; but how are you able to… I mean, survive without the internet? This is it exactly, no words to describe it; grief, loss, mourning. It’s like somebody died and the world just moves on regardless. The empty space in the middle of the desk where the computer used to be is gradually becoming a convenient place to put things; a cup of coffee, a book, odds and ends – it’s returning to the original ‘desktop’ state (no metaphor intended). I write with a pen on lined paper in an actual ‘notebook’. Back to the basics… oil lamps and candles, I want to live in a cottage in the forest, grow vegetables, chop wood. But instead of that I’m in Chiang Mai City and have convinced myself that walking two miles every day (there and back) to a nice Internet cafe is good exercise. Heavy urban traffic, often no pavement at all and obstructions like a temporary structure, fried chicken vendor/street food cooking place set up in the pedestrian area – getting the customers’ attention – I have to negotiate with the environment to get through. Cooking smells and traffic hazards, locked-in loving-kindness in conscious mind is necessary. Mindfulness is necessary in order to not be flattened by a passing cement truck. This is the developing world, Asian cultural behaviour just allows it to happen, everything in close proximity to everything else. 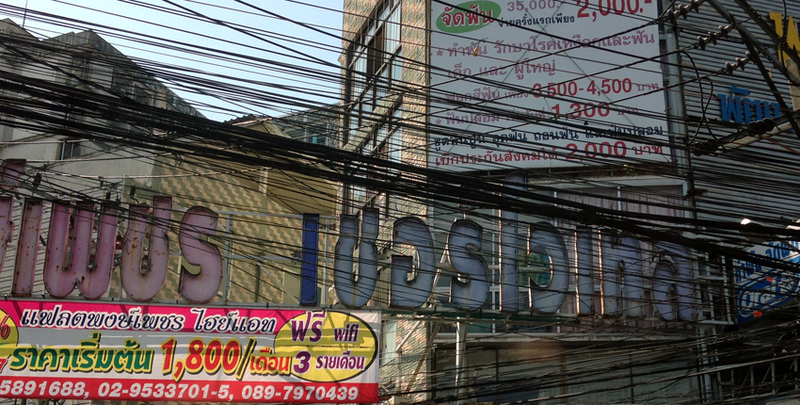 Take a photo of the hundreds of cables slung between poles I think are phone lines. Connectedness, the true meaning of the term, extended family; people have to have contact with each other all the time. There’s no such thing as overcrowding, it has always, always been like this. In pre-modern times perception was more associated with the narrative, the story by-word-of-mouth about how it all came to be like this. Now it’s a different kind of reality, a reality without a myth – or a myth that evolved over time to include the social order mechanism, television, and now it disincludes the Godman, the DIY awakening factor – don’t be too concerned about that folks, the Centre of Worship is doing it on your behalf. Not so, here in Asia, that uneasy feeling in the core of my being cannot be filled with some kind of truly invasive commercial product. It’s not a ‘hunger’ aroused by created opportunities we are encouraged to keep seeking. It’s a received knowing that extends through all and everything, a kind of interconnectedness that’s always there, an awareness of the uncountable cells in an organism and multiple organisms within organisms – all of it. Out of the street and into the cool interior of the Internet cafe. Nice people say hello as I find my place. Log in and download the text file I sent from my phone earlier in the day. Having no computer at home means I have to write my posts using the phone keyboard one-fingeredly and awkward, but learning how to develop skills in defeating the spellchecker that goes around changing all the words unasked-for. Something interesting arises in the engagement with it; having to invent solutions to problems I’m not immediately familiar with. Intuitive reaching must be something I have learned through living with local people in Asian countries for more than thirty years; trying to understand the world as seen through their eyes. An aloneness, maybe… it motivates this reaching out. ‘The internet is an extended sense organ’, all known bloggers in the world scattered around in their geographical locations, but really all contained in conscious awareness – we couldn’t be anywhere else! I can’t see you, or hear you. I can’t touch you and will never ‘meet’ you in the normal sense of the word, I just know you’re there, or here inside me, or where we all are… curious how it’s the awareness of loving-kindness that activates it. The internet is an extended sense organ,’ from a comment by Michael in the post titled ‘grounded‘ Excerpts from other comments included here. I write with a pen on lined paper in an actual ‘notebook’. A ‘notebook’? With a pen and lined paper? Oh I get it! You mean a paleo-notebook. My grandfather had one of those I think. Now it’s a different kind of reality, a reality without a myth – or a myth that evolved over time to include the social order mechanism, television, and now it disincludes the Godman, the DIY awakening factor – don’t be too concerned about that folks, the Centre of Worship is doing it on your behalf. Leave your enlightenment to Oprah Winfrey. She’s the expert. I was walking with you all along your journey. Great post. Mindfulness is necessary in order to not be flattened by a passing cement truck. Since October 2012 I’ve had a different idea of what mindfulness is and I now consider myself to be quite poor at it. I once thought of myself as so adept I used to teach it so as you can imagine it was a bit of a change in perspective. I was and remain very good at navigating heavy traffic as a pedestrian but I don’t consider that skill to be based on mindfulness at all but rather on focus. It’s about blocking out or disregarding extraneous input that does not relate to the actual or anticipated movement of vehicles, abandoning the ‘now’ in order to increase awareness of where cement trucks and your body will be over the next few moments. Of course my experience of Oct 2012 has also made me less dogmatic about such things and I’m OK with the notion that I still don’t know what mindfulness is and that your interpretation is the correct one (or more correct than mine at least). But I thought I’d pass on my perspective anyway. an awareness of the uncountable cells in an organism and multiple organisms within organisms – all of it. Don’t forget the organisms (or meta-organisms) you are just a cell of. Institutions like family, nation, church, company, the human race, etc. I think you’ll find that like human beings these organisms display emergent behaviours that aren’t explicable in terms of their components but show signs of adaptation to the environments in which they develop (communities, realpolitik, markets, etc). And also like human beings, if one of the cells starts acting in a way inconsistent with the needs of the organism it is likely to be attacked and expelled (if it doesn’t shape up or self-destruct). Of course its all just a metaphor but I think it offers an interesting insight into how institutions operate and whether it’s appropriate to hold members responsible for their behaviour (or to try to change their operation by changing the membership). According to Andy Clark the internet is part of your extended mind. You haven’t just been blinded, you’ve been lobotomised. Recent circumstances have given me an unusual opportunity to examine the boundaries of apparent self. My flatmate moved out four months ago and the houses on either side of me are vacant. I rarely get visitors or phone calls. I don’t have a TV, rarely listen to the radio and have had two computer outages and one telephone line outage in recent months. Apart from taking up the obvious opportunity for more meditation and mindfulness practice I have also been able to observe the effect of long periods of relative silence – most importantly periods of not using language. As I might have expected, my internal monologue diminished considerably and I became more aware of underlying thoughts that are not sub-vocalised or even able to be articulated. Less expected was the change in the sense of what is me/mine. Sometimes it fell away completely (not a unique experience – especially since Oct 2012) but at other times, especially just after awakening, it became incredibly strong. What’s more, when it was strong it sometimes seemed to be bounded by my skin and physical sensations but at others it extended so far that even someone walking past the house gave me a sense of being invaded. My pet rabbits and resident wildlife also sometimes became incorporated into my sense of ‘me’, so much so that I even got a post-hoc feeling of volition over their actions. I feel the need to offer some kind of summary lesson to be drawn from this but I have none, so I just offer it as an observation. Interesting distinction, I’d been thinking of it as a directed mindful receiving and the focus just falls into place by itself, in this case, due to that sense of urgency. I did forget about that and glad to be reminded, blown away by the thought of it; the tunnel created by facing mirrors, in a multi-dimensional context. And how it takes on unexpected characteristics somehow determined by the organism itself. The only thing I’d add is the thought that awareness expands so much, the way we see it from this perspective is tiny by comparison – except, of course, if you’re speaking about institutions like family, nation, church, company, etc. … suggests there’s an attachee, but yes there’s that sense of loss… being with that. I was also commenting on connectedness with or without attachment; or the two meanings of “attachment”. I was thinking of it as interconnectedness without attachment rather than with… although, hold on a minute, I’m not sure what you mean and anyway what d’you mean by the ‘two meanings of attachment’? Sorry. Didn’t mean to be abstruse. My concise comment was intended to convey two comments. Your post appeared to be drawing the reader’s attention to my and our attachment to the internet (and perhaps by extension to …) and also the interconnectedness of humans and the whole world(s). We are all attached to one another, and this also can be called attachment. Does that clarify my intent? Well it clarifies it for me thanks Ben. I couldn’t follow you because I’d just never thought of the interconnectness of everything as an ‘attachment’ before. Maybe a reflection or maybe even complete identity. But yeah, you pull on one bit and the whole lot shakes (including the ‘puller’) so you can see it as attachment. Hey Cabrogal, I have to use names here to identify who is who. Isn’t there something in the Sutta on dependent origination about a tangled skein of wool or cotton and the end of it is impossibly irretrievable? I was trying to remember the details or the sutta reference for my uncle about a month ago but could neither recall it properly nor find it with Google. If you find it please post a comment. If I do first I’ll do the same. Yeah, it’s after 1am here but I’ve got a sick little bunny and aren’t getting much sleep. Two more force feedings and one more medication to go ’til bedtime. As someone who spends a fair amount of writing poetry my inner ear is always on the lookout (to mix images 😉 ) for alternative readings in words and phrases, double meanings, metaphors, idioms, turns of phrase etc. No worries for not having a source link to hand. I have some recall of the Five Skandhas. In this connection, have a look at this when you have access. (Personally I have no connection to Facebook or Google+ and do not even use Google as a search engine. You know I just wrote a blogpost with a section on craving and I still couldn’t recall the reference. I’d misremembered the metaphor as one of interconnectness or kamma and had lost the link to tanha entirely. Just a manner of speaking, you know. It is what it is, I’m surprised how it appears in different moments and instances… How’s the little guy this morning? You guessed right, it’s the little guy again. Ananda is the cloud coloured dwarf lop. He seems to be over the hump. Eating a little without being forced. Crapping again, though not much. But I don’t think he can afford to lose much more weight. So we’re both going to get covered in porridge-like high-density rabbit food a few more times yet. If you get that satellite dish up the coconut tree be sure to take a picture and post it to the blog. Another one of my periods of extended silence was on Koh Lanta during the 1987 monsoon season. I was the only farang on the island and the bungalow owner just unlocked it and left me to fend for myself. I spent most of my time alone and much of the rest with a group of young Chao Le who spoke as much English as I spoke Thai. About four phrases. I’d only completed a month at Wat Suanmoke near Chaiya a couple of weeks earlier and Koh Lanta was even more silent and peaceful (and free of scorpions). My people have a tradition of ‘going Walkabout’ – spending long periods alone in the bush visiting sacred sites and performing rituals. One day the primitive savages who took over this country might discover its benefits. Shantikaro’s still there? I’m a little surprised. If he’s been there that long a lot of the spikes must have worn off by now. What about the tortoises? And the scorpions? I can’t honestly say I met Buddhadasa. He briefly addressed a couple of our sessions through a translator and that was about it. But his charisma was palpable. For a while afterwards I was like “Yeah, if anapanasati can do that I want some!”. I sometimes wonder if my subsequent focus on anapanasati and relative neglect of vipassana and metta might explain some of my current spiritual ‘imbalance’. One of my grandfather’s favourite piss takes of my Uncle Jock was that if he got his nose too close to the prawns Pop might accidentally peel and eat it. Well, things just move on, evolve, don’t they; imbalace and balance. There was a book, Mindfulness with Breathing. 16 steps,was it? Must still have that around somewhere. There was a German monk around that time Sukkhacitto. He reordained in the Ajahn Chah lineage and I saw him in Amaravati in the summer. I write with a pen on lined paper in an actual ‘notebook’. Back to the basics… oil lamps and candles, I want to live in a cottage in the forest, grow vegetables, chop wood. But instead of that I’m in Chiang Mai City and have convinced myself that walking two miles every day (there and back) to a nice Internet cafe is good exercise. I relate to this. My spirit says I want to live in the woods and grow vegetables…but I am probably just kidding myself. Could I live without the internet? Maybe…but it would take some re-conditioning! Loved this post! Thanks for your comment Elizabeth. Yes, the Buddhist loving-kindness, metta, I was thinking of it as a mind state we can apply in situations of adversity. The difficulty of making my way through overcrowded streets and encroaching traffic – because this is what Chiang Mai is like today… thirty years on. I was here then too, it was like a village compared to how it is today. A large number of Chinese tourists come from Yunan, Southern China, as well as European tourists and backpackers. Hotels and condos being built, constant traffic of construction vehicles. So it’s necessary sometimes to think of all the movements of the body in terms of loving-kindness, step by step. Careful not to trip on obstructions because it can be dangerous. Having said that, it’s still a wonderful Northern town, fresh mountain air and the people are so friendly. You would find the same quality of thirty years ago if you were to visit again, just a bit more like a city. Not getting your posts and missing them– so I key in the name and sure enough there is one there. I tried unfollowing and then following again to make the connection? Great post. Great photography. Got a real flavor for being there. Husband lived in Cairo– sounds much the same though different religions and philosophies. But the daily life… well, similar in some ways. Hope you can get online again soon. And hope your posts wind up in my box now. I’ve heard other people use the Cairo comparison, must be generic, no camels here, extraordinary events take place, yes, but different religions and philosophies as you say. I’m not there at the moment in fact, I’m in tbe South of Thailand, near the Malaysian border, Jiab’s family home – it’s a wedding – hundreds of guests. Right now in a house in an old rubber plantation. It’s raining heavily and I’m keying in on my little phone screen with only a one-bar network connection on 3G – a technical miracle if it gets through. With all the comments I read on my scroll down all I can add there is no wall that can not be penetrated. What was old is now new, when what is new is gone. While it is missed today you will find it new and exciting when it returns. Tiramit, ever since you began writing about your computer woes I have been pretty much stunned speechless by the thought of your typing posts with your thumbs. One long text message on my phone and I feel like I need to let out a deep breath and walk around the block four times shaking out my hands. Look at the sky. Think of a childhood memory. Remember something I was supposed to be doing. Kudos, my friend, for your patience… All these comments must be killing you!! Ha! Please don’t feel you have to answer my long winded comments. If there is something you want to say in response I can wait until you get your keyboard back. I’ve got email notification on them. I like the idea that you can go to the beach and intentionally forget the internet connection. It’s not easy to let go of the link, we have to take it by surprise somehow 🙂 The world of Nature returns from that place where we don’t usually notice it….